Which Of These People Is Cherokee? If some of these individuals do not fit your notion of what the Cherokee were like, you have quite a surprise coming. 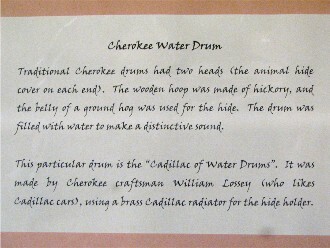 By the 1830s, when Red Clay was functioning as an important governmental center, the Cherokee had adapted remarkably well to the American culture which surrounded them. At this time, the Cherokee had a government based on a constitution similar to that of the United States, elected officials, written laws, a Supreme Court, and law enforcement officers. Some were Christians, many spoke English. 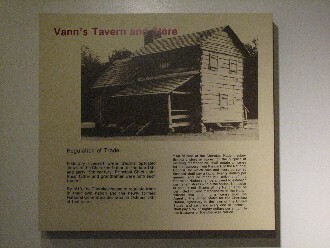 They practiced trade, agriculture, and industry much as their American neighbors. 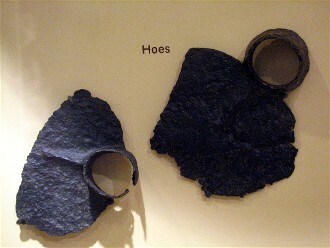 Still they retained much of their own unique culture. So you see, all these people – the hunter, the farm woman, the blacksmith, the statesman, and the athlete – are Ani-Yun-Wiya or “The Real People”; we call them Cherokee. When I was checking the Internet to see what others had to say about Red Clay, I ran across a site about Tennessee history for kids, which condensed the Red Clay story fairly nicely. Later I found additional brochures and flyers in my files with bits of information I thought added to the complete story. As was the case on the first page, the quoted historical text courtesy of other sources will appear in stand alone boxes unconnected to my photos. 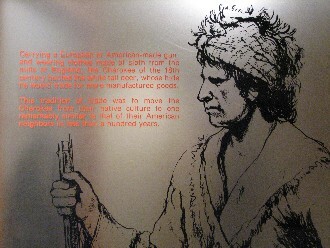 Text from the displays will appear with the photos (as in the above instance of the Which Of These People Is Cherokee? 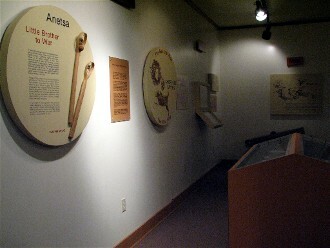 exhibit). 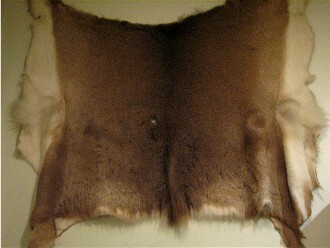 Carrying a European or American-made gun, and wearing clothes made of cloth from the mills of England, the Cherokee of the 18th century hunted the white tail deer, whose hide he would trade for more manufactured goods. This tradition of trade was to move the Cherokee from their native culture to one remarkably similar to that of their American neighbors in less than a hundred years. photographed by James Mooney around 1890. 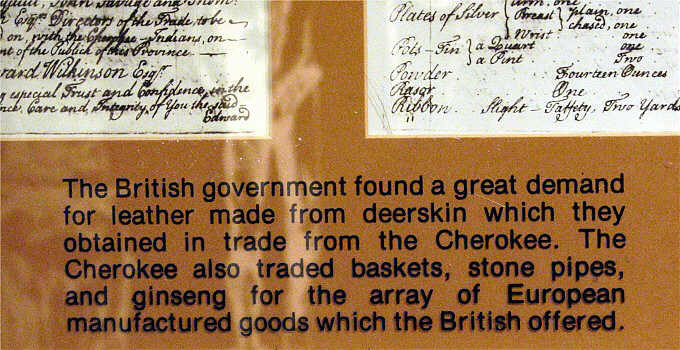 Originally a basically agricultural people, the Cherokee turned to the hunting of deer and traded skins for European manufactured goods. 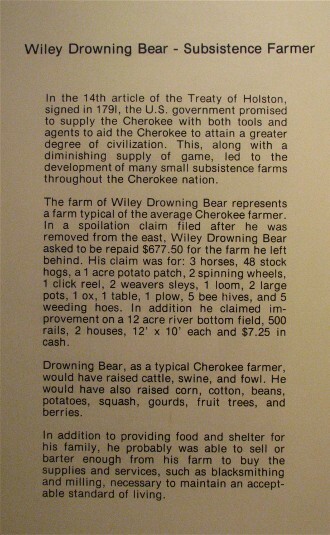 After the Revolution, the U.S. government ironically urged the Cherokee to change their hunting for the “white man’s path” of agriculture. 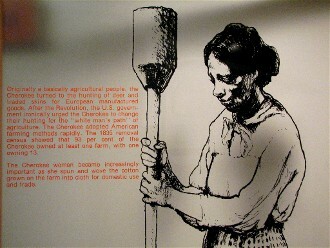 The Cherokee adopted American farming methods rapidly. 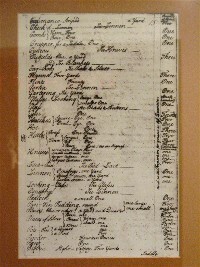 The 1835 removal census showed that 93 per cent of the Cherokee owned at least one farm, with one owning 13. 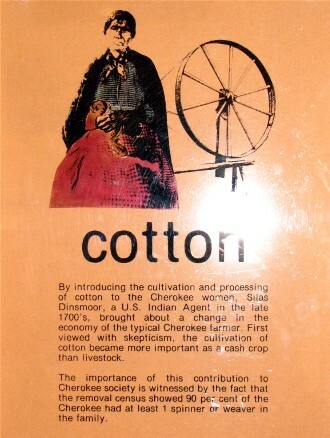 The Cherokee woman became increasingly important as she spun and wove the cotton grown on the farm into cloth for domestic use and trade. 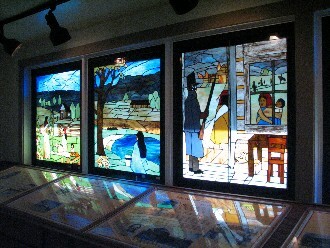 "In 1832 things were looking grim for the Cherokee nation. 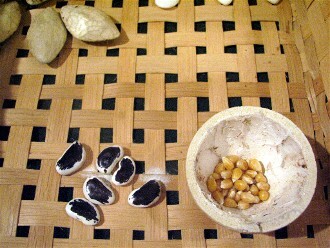 Stripped of their rights in the state of Georgia, members of the tribe moved their seat of government from New Echota in northwest Georgia to Red Clay, just across the Tennessee state line. 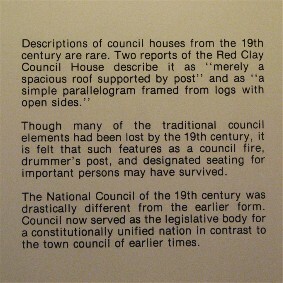 But Red Clay would not be the Cherokee capital for long. Only six years later the tribe would be sent west on a journey we now know as the Trail of Tears. The Red Clay grounds are now a state historic park . 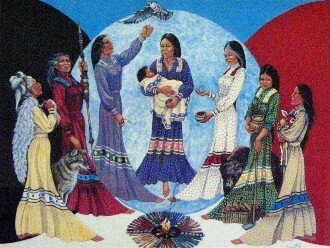 . . . . . . its story.
. . . the Cherokee tribe once ruled over a large part of the southeast United States. But as white settlers moved west and forced their way onto Cherokee land, Cherokee leaders signed away or sold large chunks of the land, sometimes under political or military pressure . . . by the 1820s the tribe only controlled part of what is now southeast Tennessee, southwest North Carolina, northeast Alabama and northwest Georgia. In spite of the loss of so much of their land, most Cherokees assumed they would be allowed to stay in this section of the country forever. After all, they had co-existed peacefully with the American government ever since the brutal Nickajack Expedition of 1794. 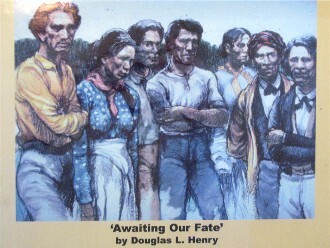 Many Cherokees had fought for the American government, such as at the Battle of Horseshoe Bend against the Creeks. 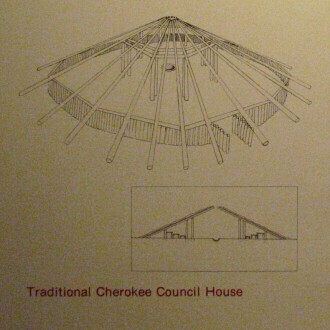 More importantly, the Cherokee nation had largely adopted white ways: becoming farmers, taking on a democratic form of government under a constitution, adopting Christianity, and even creating a written language. 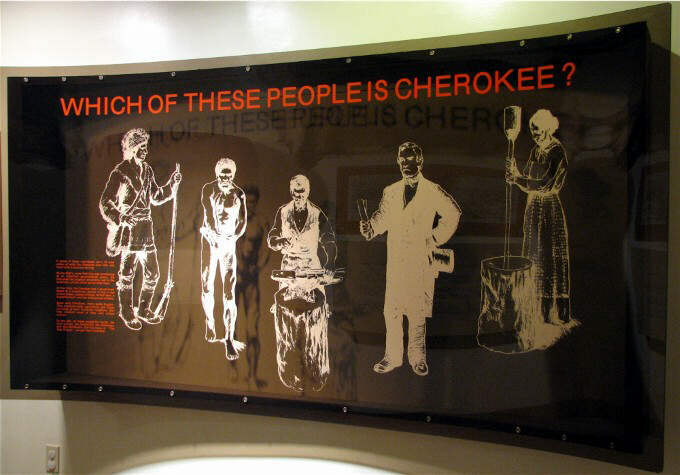 By the 1820s Cherokees were more likely to be literate in the Cherokee [language] than white settlers in this part of the country were to be literate in the English language. 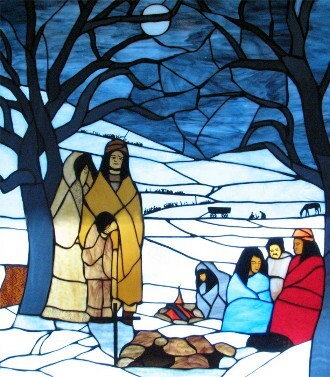 Cherokees frequently went to church. 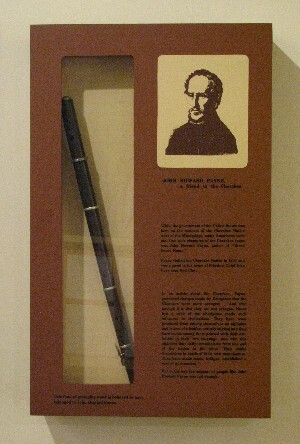 They even had a written newspaper, The Phoenix." Many of the ferries operational in the early part of this century traced their beginnings to Cherokee Ferries. Blythe Ferry which still operates on the Tennessee River about 15 miles northwest of Cleveland, and Washington Ferry, near Clayton, were both originally Cherokee ferries. 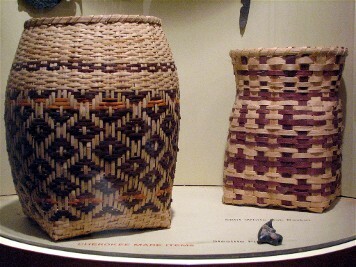 Because of the Cherokee’s knowledge of their territory, early white travelers in Indian country were dependent on Indian assistance in crossing rivers and streams. 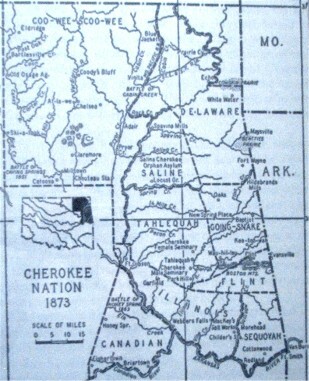 This eventually resulted in the Cherokee’s operation of ferries on the major rivers in the Cherokee Nation. Ferries were not only profitable businesses for their Cherokee operators; they, along with Cherokee-owned toll roads, helped facilitate the growth of business and commerce throughout the Cherokee nation. 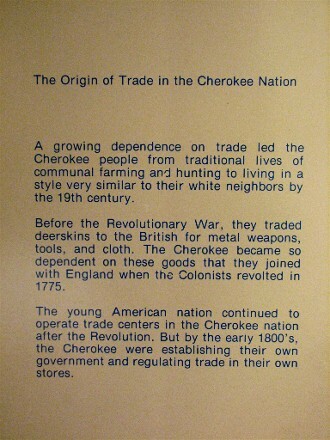 Federally licensed white traders operated stores in the Cherokee Nation in the late 18th and early 19th century. 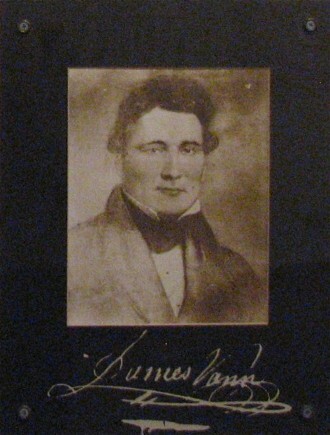 Principal Chief John Ross’ father and grandfather were both such traders. 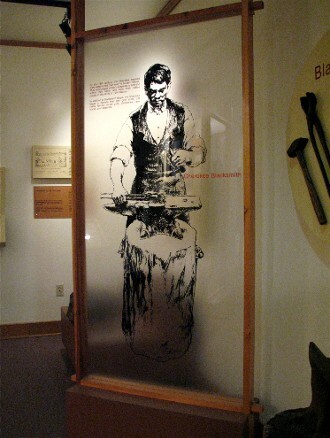 I addition to blacksmith shops, the Cherokee began to operate their own grist mills, toll roads, ferries, cotton gins, distilleries, race tracks, and sawmills. 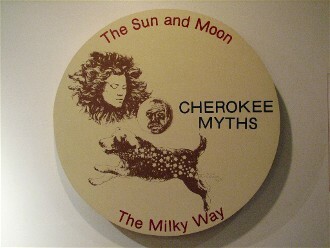 "In 1828, however, two things occurred that sealed the fate of the Cherokee nation east of the Mississippi River. 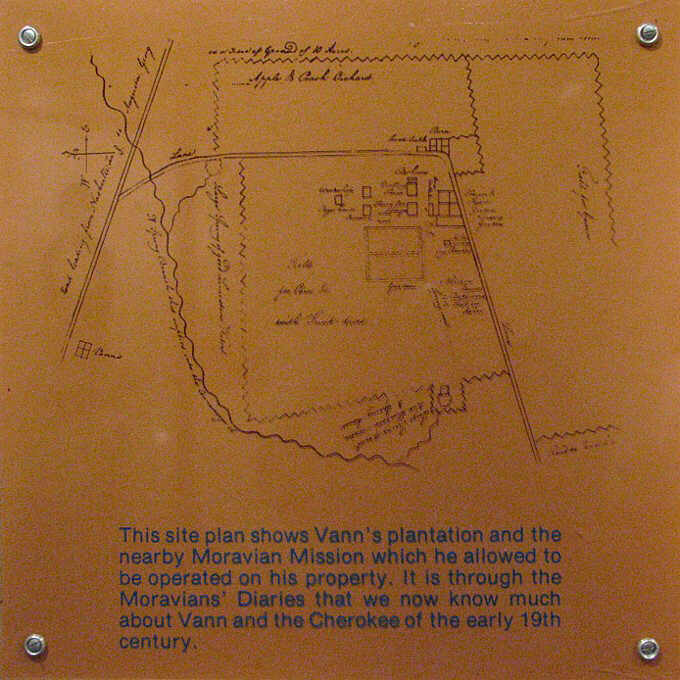 First, gold was discovered on Cherokee land in Georgia, resulting in a massive encroachment by white settlers onto Cherokee property. Then, Andrew Jackson was elected president. Though he could be kind to individual Native Americans, Jackson did not believe Native American culture could coexist with the United States. 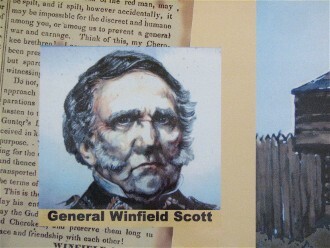 He immediately pursued a policy of removal – of forcing the Cherokees off their land and relocating them to points west of the Mississippi River. 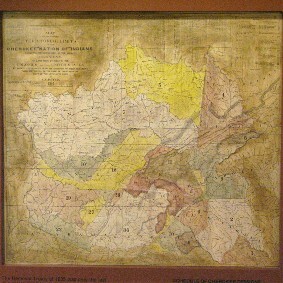 Here is where Red Clay comes into the picture: by 1832 the Georgia legislature had taken away all Cherokee legal rights, stolen the Cherokees land and made it illegal for Cherokees to hold political meetings. 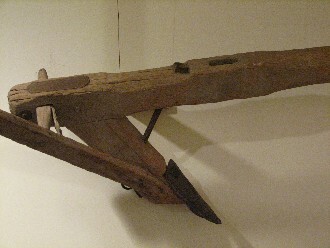 At that point the tribe moved its capital to a site just north of the Tennessee/Georgia state line (during this era, individual states had far more power than they do today). There was a spring on the site called Blue Hole Spring that is still there today. There were no structures there, so a council house and a few cabins were hastily built. 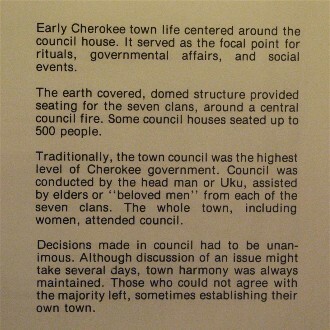 A council was a time when the Cherokee people came together to meet and for their leaders to discuss things important to the tribe. 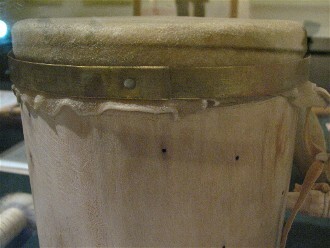 Councils generally lasted between two weeks and a month. 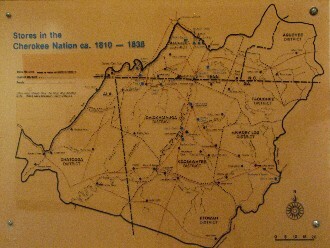 The Cherokee had 11 separate councils here between 1832 and 1838. 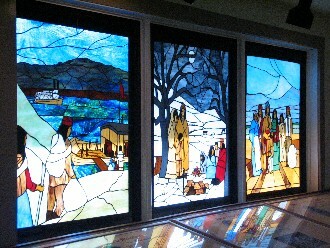 Although young children might have had fun at these councils, these were desperate times for the Cherokee people. In spite of President Jackson's insistence that they would have to leave, the Cherokee people still held out hope that John Ross would be able to work out a deal under which they could stay. 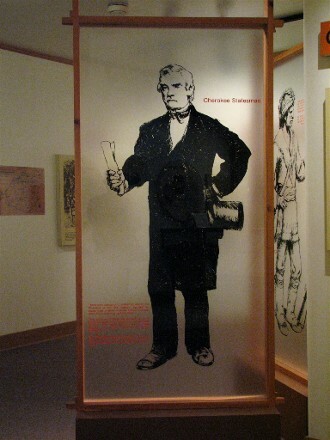 The Cherokee people had a good legal case, since the U.S. Supreme Court under John Marshall had ruled that the 1830 Indian Removal Act was unconstitutional. 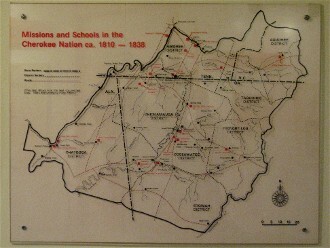 However, it was here that the Cherokees realized that the U.S. Supreme Court ruling would not help them. Here they also learned that a small group of Cherokee leaders (led by Major Ridge) signed the so-called Treaty of New Echota, which purportedly sold all the Cherokee land east of the Mississippi to the American government. After John Ross learned about this treaty, he tried hard to get the U.S. Senate to reject it (an effort that failed by one vote). After that effort failed, more than 15,000 Cherokees (practically the entire tribe) signed a petition protesting the treaty and disavowing those who had signed it. But the American government used this treaty as final justification to force the Indians off their land." There were outstanding statesmen among the Cherokee of the 19th century, perhaps because their original cultural system stressed unanimous approval and harmony. In times of crisis, one town frequently became a strategic focal point and thus was regarded as a “capitol” by European observers. 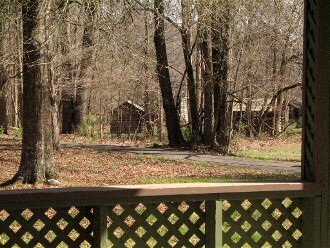 The town of Chota, in East Tennessee, often served this purpose. 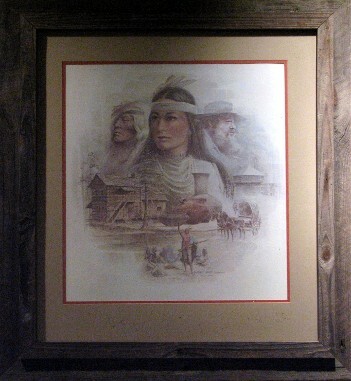 In the 19th century the center of the Cherokee government shifted to the rich farming regions of the south. 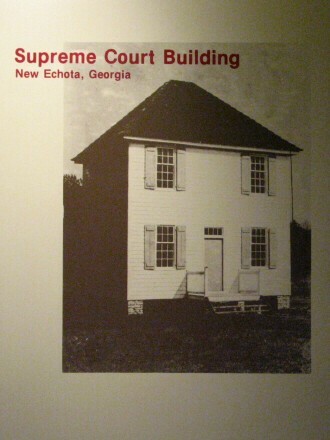 National Council met in several locations until a new capitol city, New Town or New Echota, was developed in northern Georgia. 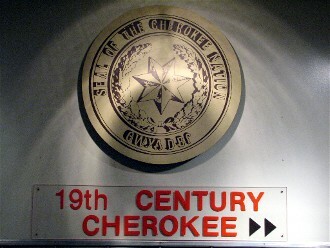 When Georgia declared it illegal for the Cherokee to meet for any purpose other than signing a removal treaty, the seat of government was moved to Red Clay. Council met here periodically from 1832 until 1837. 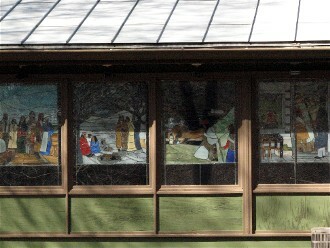 "The stages of Cherokee removal are depicted in the series of stained glass windows at the Red Clay visitor's center. 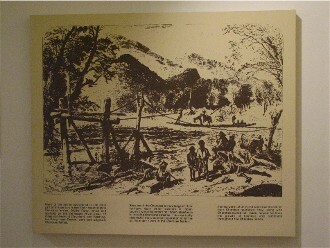 In the fall of 1838 the U.S. Army began forcing Indians into staging camps near the Tennessee River. From there some went downriver on boats, while others marched northwest. Today we estimate that 4,000 of the 15,000 Cherokees died either along the way or in the holding camps, which is why we refer to it as the Trail of Tears. The trip was especially hard on the elderly and young children. Those who died were usually buried in unmarked graves which are now all over Tennessee and Arkansas. After they left, all the structures that had been built at Red Clay were torn down, and the land became part of a privately owned farm. 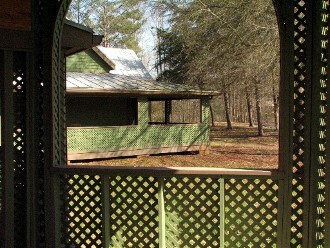 They remained so until 1979, when its owner sold it to the state of Tennessee to be used as a historic park. Among the structures you will find there today are a visitor's center, a replica of the council house, a replica of a small Cherokee farm, and a replica of some of the small cabins that were built there during Red Clay's short stint as Cherokee capital. 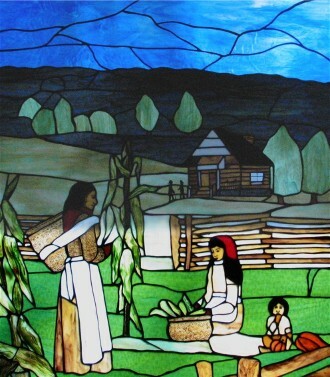 The small farm replica is meant as a reminder of what life was for many Cherokee by the 1820s – a generation after the tribe adopted so many aspects of white culture. 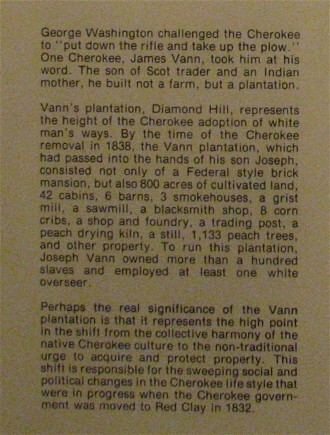 However, there was not actually a farm here when Red Clay was the Cherokee capital." 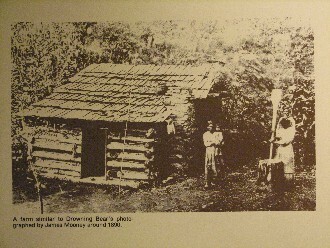 Payne visited the Cherokee Nation in 1835 and was a guest in the home of Principal Chief John Ross near Red Clay. But in the end the support of people like John Howard Payne was not enough. 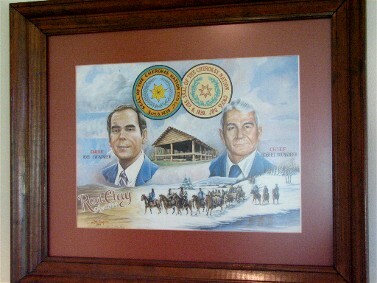 "In April of 1984, the first joint council meeting of the Cherokee Nation and Eastern Band of the Cherokee Indians was held at Red Clay. To reaffirm Cherokee unity after 146 years of separation, an eternal flame was placed at the site of the original Cherokee Council house." I took pictures of several signs about the Trail of Tears. 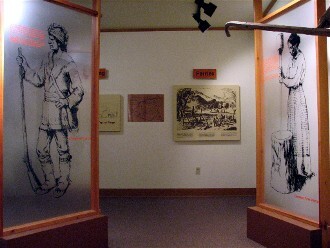 The Roundup and Stockades image in the previous panel is the top cropped portion of one of those displays. I also have shots of a New Echota display, then Red Clay, Forced Removal (The Water Route), Removal Overland, and Reaching Indian Territory, all of which combined provide a nice visual and informational timeline. Unfortunately, the spotlights used to highlight the displays, combined with the reflective light coming in from outside, made it very difficult to get good images. You may have already noticed some of that in the pictures used on this page. 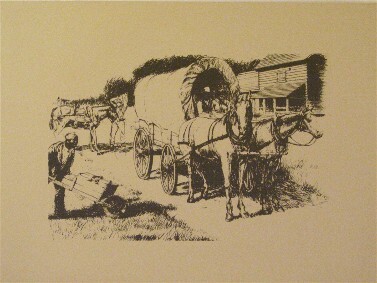 Since I have much information elsewhere about the Trail Where They Cried, and someday, God willing, will do a page dedicated to just the Trail of Tears, I decided to skip those and simply wrap up this page with a number of the miscellaneous photos which did not make it into the progression. 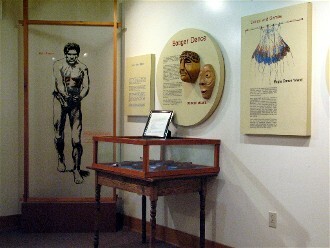 "The Red Clay Council Grounds became the center of the Cherokee Nation's diplomatic efforts to avoid removal. 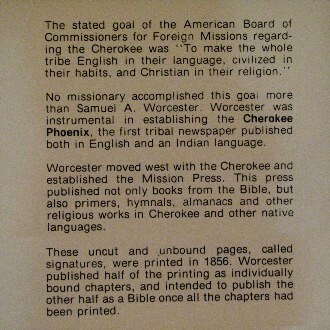 At the Cherokee Council in October of 1835, Rev. John F. Schermerhorn, a Baptist minister, appointed by President Andrew Jackson to negotiate a voluntary removal treaty with the Cherokee, addressed the council. Chief John Ross, Elias Boudinot, Major Ridge and John Ridge were among the prominent Cherokee in attendance. The assembly of as many as 4,000 Cherokees overwhelmingly rejected the proposal. 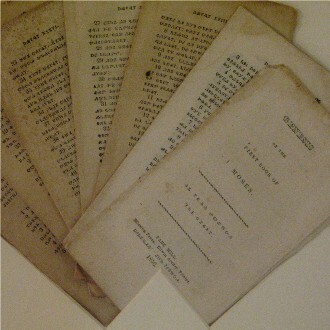 Two months later Schermerhorn met with a small group, who had no authority, but were in favor of the removal, and signed the treaty of New Echota. Despite a chorus of nationwide protests and a petition with 15,565 Cherokee signatures denouncing the document as a fraud, the Treaty was ratified by the U.S. Senate on May 23, 1836 and the Cherokee people were given two years in which to voluntarily remove from their homeland. 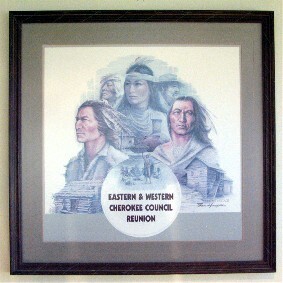 September of 1836, the Cherokee Council again met at the Red Clay Council Grounds to discuss the New Echota Treaty. Chief John Ross presided and over 3,000 Cherokee were in attendance, including representatives from the pro-treaty faction. Brigadier General John E. Wool, who commanded the troops engaged in the removal, observed the meeting, and John Mason, Jr., a special agent of the United States, addressed the crowd. 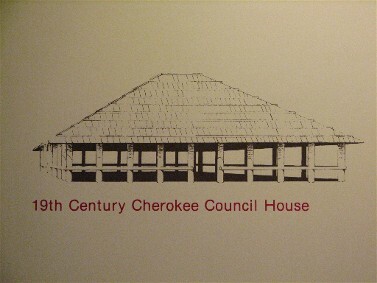 The Cherokee unanimously voted to reject the New Echota Treaty. Those who had signed the treaty refrained from voting in fear of retaliation."